With very difficult weather conditions on Day 3, RWC Sevens Moscow concluded this evening with New Zealand taking both the Mens & Womens titles. The weather played a major part in the final days play with heavy rain leaving the pitch surface at the Lizhniki Stadium drenched and making handling conditions extremely difficult. [frame align=”center”] 2013 Womens Champions – New Zealand Photo: IRB / Martin Seras Lima[/frame]Indeed many teams found it impossible to find their feet. But through it all, in the Mens, it was the All Black Sevens who maintained sufficient control, pace and precision to power their way to a convincing victory over England in the Final by 33-0. 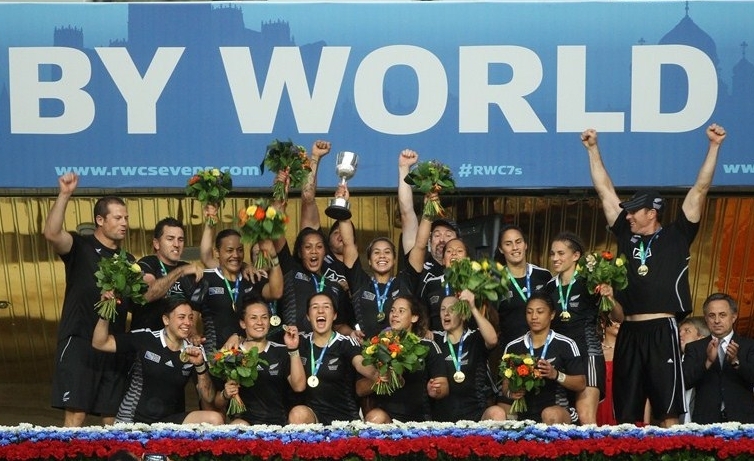 And in the Women’s Final, New Zealand showed equal ability in tricky conditions to defeat a defiant Canada by 29-12. At the SB5 Beach Clubhouse, two teams that really caught our eye over the weekend were the Kenyan and Russian mens squads. In terms of Kenya not only did they top their group with 3 wins from 3, they went on to beat France in the quarter finals and were only just edged out by England in the semi’s. [frame align=”left”] ‘Bowl-Victory Russia’ Photo:Ludmila Bochkova[/frame]In terms of Russia, good result also for the home squad, who outplayed Japan to win the Bowl Final. As a growing forces in Rugby’s shorter formats, we reckon it won’t be too long before one day we’ll see the Kenyan’s & Russians on Lignano’s golden sands. Congratulations to the IRB and all involved for a well run tournament.